How do elk swim? I think he walked over a bridge! His name is "Bruiser." OK, it's definitely a fluid dynamics problem to figure out how a lone elk can land our elk-less island. Don't get ants in your pants, this is not post about how humans got to Easter Island or about genetic evolution. It's just a story about one lonesome male elk. I live on an island. There are three ways to get here: (1) drive over a bridge; (2) take a ferry; or (3) swim. It's 100% unlikely that this moose did not ride a ferry to our island, probably not quite so certain that he walked over the bridge. So, the common assumption in our local media is that he swam. But, if that's true, why didn't he swim back during rutting season? My hypothesis below is that he's actually not a good swimmer, that he didn't get here by swimming, and that he walked here. If that's true or even likely, we should shoo him back over the bridge so that he can not be so lonely! Having worked in Yellowstone National Park for many years, I can attest that (a) bull elk are not happy during mating season, and (b) that they will great distances for you-know-what. Here's the story: This handsome guy appeared on Whidbey Island in September of 2012, and is the only elk on Whidbey. He is probably a healthy bull in a mainland herd that no longer tolerated him. The common pattern would have been for him to find new land with a few accompanying females and start a new herd. But, here is now, alone on Whidbey. But, one year later during rutting season, he's still here? According to the Washington Department of Fish and Wildlife, "the animal decided to stay put." But, is that realistic? If Bruiser could get back to the land of bountious females, would he actually "decide" to stay put? Not a chance in my experience with elk. So, what is going on? A healthy male elk lives about 15 years in the wild, and can weaight up to a half-ton. Like Bruiser in the photo, they can sport great racks (which everyone on Whidbey hopes will NOT become a target of illegal hunting--beware: there' a great island-watch on this guy....) How far would he have to swim?Elk are strong swimmers, aided by hollow hairs that keep them buoyant. During mating season, they "buggle" a mating noise that carries very long distances. You can see videos of them swimming, but if you Google "elk swim distances", there's no world record for an elk swim. They can definitely ford rivers, but is it an "easy swim" from the mainland to Whidbey as the Washington Department of Fish and Wildlife is saying? At best, this guy started in a herd in Skagit Bay on the mainland as Fish and Wildlife believes, he would have swum 4-5 miles direct from the Skagit tributaries to here. Not likely? At the very best, he'd have wandered up to Deception Pass (by himself, without his mistresses?) to Deception Pass where he had a narrow passage, but harrowing waters. If he got that far, why not walk across the bridge? On those autumnal days when there are few tourists, long dark nights, why would an elk near the bridge not just take a walk? It would certainly explain why he can't find his way home! What if Bruiser's females are just out of reach on the other side? It's clearly a fluid dynamics problem (Aside: traffic flow is a fluid dynamics problem) to reunite Bruiser with his herd! It's also an environmental problem because the Skagit Valley herd of 1700 elk have been driving Skagit Valley (mainland) farmers crazy over decades eating their crops. Fertile male elk are being culled from the herd by Federal, state, and tribal hunters, and they are authorized to kill 15 at the moment. Maybe Bruiser is a very clever elk. To storm or not on this Thanksgiving? Hmmmmm...who to believe? If you read CNN.com here, you get the impression that Thanksgiving is going to be a mess. In fact, that article is on the front page of CNN.com with titles "Massive storm for Thanksgiving" and "A side of weather with your story." I was feeling smug that I am staying local for Thanksgiving, and so I turned for a local forecast to my favorite northwest meteorologist Cliff Mass's blog, which is particularly funny today and, as usual, educational. And, what did I find?An essay on the "lack of storminess and ill-weather" in the Thanksgiving prediction! Cliff usually takes on the Seattle Times, but he missed a chance to take on CNN today! If you read the text of the CNN article, you can see that they are talking about yesterday, today and Tuesday mostly, not about Wednesday through Friday, but the headlines are certainly misleading. The only place on the mainland to see significant precipitation is far NW Washington State and, Cliff says, "not many folks live there and most of those watch Canadian TV. In other words, they don't count!" (The comments posted today reflects that he has a tolerant readership up in that area of Washington!) He really is in good form in this post. High pressure dominates most of the nation, there are no low pressure systems influencing the mainland (there is one noticeable one off the coast of southern California). He also points out that today (Nov. 25th) is the 6th straight day without rain in the Seattle area, when the normal chance of rain at this time of year is 65%. It looks like we could squeek by through Wednesday without rain, with some moving in on Thanksgiving. That would be 8 straight days without rain, and according to him, the chance of that is about 3%. But there's more to the story. According to the National Weather Service Weather Prediction Center, Wednesday could be messy in the midwest and east coast. Temperatures will be 10-20 degrees below average in the central east coast and upper midwest regions, and a front over the Great Lakes will produce lake effect snow over the Great Lakes through Wednesday (this does bring back memories of Thanksgiving storms where I grew up in Northwester Pennsylvania, where we got the lake effect snow from Lake Erie). A storm developing over the Central gulf coast will move toward this Great Lakes disturbance to produce moderate to heavy rain that will move from the central Gulf Coast into the Appalachians by Tuesday morning. This system of rain will then move east to the Mid-Atlantic on Tuesday and expand into Northern New England by Wednesday morning. Snow will expand into the Lower Great Lakes Tuesday evening and Wednesday. So, in detail, it's complicated and worth reading the various forecasts/news articles carefully. As, Cliff also pointed out, Thanksgiving and the first day of Chanukah coincide this year, the first time since 1888, and the next time may be 77,000 years from now! Compounded with the fact that Comet Ison will be the closest to the sun and brightest that same day, as Cliff says , "Happy Thanksgivukkah", or maybe better, "Happy IsThanksgivukkah!" Although confirmed estimates of deaths due to Typhoon Haiyan remain around 1200, there are now credible speculations that there may be as many as 10,000 dead in just one village. My condolences to the people of the Philippines, and best wishes that supplies reach you quickly. According to this Reuters.com article, 70-80% of the structures in the path of the typhoon were destroyed. Most of the deaths appear to have been caused by a debris-laden storm surge that swept away whole villages. The capital of Leyte province, Tacloban, lies in a narrow cove where storm surges can be focused toward the city. The storm surge appears to have surged at least a half mile inland. November 9, 2013 Super Typhoon Haiyan imaged by NASA Astronaut Karen Nyberg on NASA's ISS. The country was not unprepared for this event, and it is sobering that so much damage could still occur. A question not often addressed is: Are there storms simply too strong for even modern engineering to provide safety? The heartbreaking scenes from this storm are so similar to those of the tsunami damage from the 2011 Tohoku tsunami that it appears the answer may be "yes." Could people have survived if all buildings had been made of concrete, and made so tall that people could take refuge above the 15' high storm surge reported? Can concrete buildings be designed to withstand 250 kilometer per hour (155 mph) winds? Haiyan, although the strongest cyclone to make landfall is the fourth strongest in terms of measured wind speeds. Kerry Emanuel, Professor of Atmospheric Science at MIT, specializes in hurricane physics (see several references to his work at ** below). A tropical cyclone is driven principally by heat transfer from the ocean. They generally develop over water whose surface temperature exceeds 26 C. They occur in three main belts generally within 5 degrees latitude. The cyclones then move westward and poleward at speeds on the order of a few meters per second. Cold water kills them as can unfavorable atmospheric winds. Emanuel is famous for, amongst other things, his analysis of hurricanes as a Carnot heat engine. The Carnot cycle is a basic concept in thermodynamics. A thermodynamic cycle is the set of thermodynamic conditions (such as pressure, temperature, entropy, enthalpy) reached in a system as energy is transferred from warm to cool regions. In the process, some of the energy is converted to mechanical work. In the cross-section diagram to the left, the horizontal axis shows distance from the center of a cyclone, and the vertical axis shows altitude. The colors, from deep blue to dark red represent entropy, with the cooler colors indicating lower entropy. Evaporating sea water transfers energy and entropy from sea to air, and this causes air to spiral inward from A to B. As it moves, the temperature of the air is nearly constant (an isothermal process), its volume increases as it flows toward the low-pressure core of the cyclone, and its entropy increases. The air then rises rapidly upward (in the eyewall) and outward, from B to C, so rapidly that the process can be considered adiabatic and isentropic (note how the path B-C lies within the constant yellow color). Once away from the storm center at C, the air generally mixes with other storms and is lost from the system, but in idealized models, the air radiates in the infrared wavelengths into space, a process Emanuel considers nearly isothermal, and so it loses entropy. The air then sinks again (D-A) and warms through (nearly) adiabatic compression (in the deep blues of constant entropy). This closes the Carnot cycle. Emanuel then shows that the velocity of the surface winds is proportional to the difference in temperature between the ocean surface and the high-level outflow (conveniently, 100 C in the figure shown) and the thermodynamic disequilibrium between the ocean and atmosphere, E, which is the difference between the enthalpy of air near the surface and of air in contact with the ocean. Using these concepts, Kerry then showed (in a 2003) paper, that a limit on maximum sustained wind speeds is about 85 m/s or 195 mph. (He did not comment on the possibility of higher winds as shown in the table above.) He also showed that the average cyclone dissipates about 3E12 watts, equal to the total electrical power consumption in the US in 2000, and that an exceptionally large storm can generate an order of magnitude more power. **K. Emanuel, Tropical Cyclones, Annual Reviews of Earth and Planetary Sciences, 31, 75, 2003. **K. Emanuel, Divine Wind: The History and Science of Hurricanes, Oxford U. Press, New York, 2005. **K. Emanuel, Hurricanes: Tempests in a greenhouse, pp. 74-75, Physics Today, August 2006. How does Super Typhoon Haiyan ("Yolanda") compare with Jupiter's Great Red Spot? 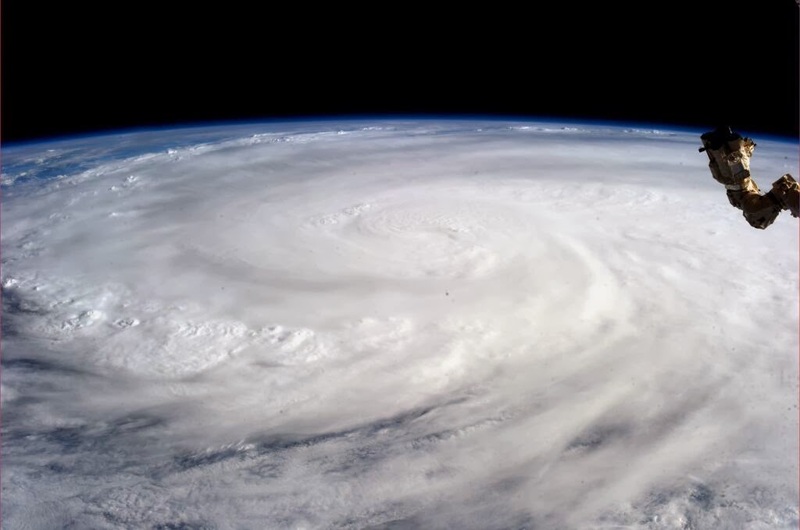 Super Typhoon Haiyan is now being called one of the largest storms ever. For a nice display of images of 13 of the largest storms, see here. Other posts on this blog related to this are: Super Typhoon Usagi in the Philippines just six weeks ago, including a Table of the Categories of hurricane (cyclone) strength; Tropical Storm Phailin and Thailand; and Cyclone Tracy and the Bill and Boyd song "Santa Never Made it to Darwin" (because Cyclone Tracy struck on Christmas Eve and Day, 1974). Here is a link to Dave Petley's Landslide Blog that has a post today on the landslide potential due to the storm. Super Typhoon Haiyan is headed toward the Philippines, due for landfall Friday morning (here's the CNN.com report on it). At the moment its winds of 195 mph with gusts up to 230 mph make it a Category 5 on the hurricane scale [Note: Weather.com put the winds somewhat lower--sustained at 134 mph and gusts to 155 mph]. (For comparison, we had a fairly major wind storm on Whidbey Island a week ago with winds up to 40-60 mph! Took down a lot of tree branches and some trees, caused power outages not only here but on the mainland for 8+ hours. Quite humbling to think of what it's going to be like in the Philippines.) This is the largest storm to date this year; its diameter is about 800 km (500 miles). For comparison with Yolanda, the most intense sustained winds appear to have been in about 190 mph in several typhoons (Typoons Tip, Grace, Vera, Sarah in the Pacific, and Hurricanes Allen and Camille in the Atlantic), so Yolanda is on-course to be close to a record-setter. More than 3800 people have been moved to evacuation centers, most from the central region of the Philippines. As shown on the adjacent map, the typhoon is projected to cross the South China Sea (to the west of the Philippines) and then hit Vietnam and Cambodia. It's speed has been 20-24 mph. The winds and rain from the storm are one thing, but there are other dangers. The island of Bohol in its path was hit by a magnitude 7.1 earthquake just a month ago. 350,000 people were displaced by that quake and are extremely vulnerable. Last December, Super Typhoon Bopha hit the southern Philippines, killing over 1000 people and affecting six million. A quarter million homes were damaged or destroyed. Landslides during storms in the Philippines are a constant danger. would be a tiny dot just barely visible. According to the International Business Times, a Philippines government website specifically dedicated to disaster reduction was hacked just as the typhoon approached and, as of yesterday, was still not accessible. The website was supposed to provide Filipinos with real-time information about threats such as cyclones, tsunami, floods, landslides and fires, as well as providing general safety advice on preparation and surviving disasters. How do our earth storms compare to the Great Red Spot on Jupiter? This storm was first observed by Cassini in the late 1600's, and scientists believe that it is actually older than that. This is an anticyclonic storm (rotates anticlockwise) with a period of about six Earth days (14 Jupiter days). It's 24,000-40,000 km in EW direction, and 12,000-14,000 NS. It is large enough to contain 2-3 Earth's, so even our biggest storms don't compete! Winds around the edge of the spot reach 432 km/hour (268 mph). See the Figure caption to compare Super Typhoon Haiyan with the Great Red Spot!